If it’s plants you need, you won’t have to look further than PlantShop GURI. 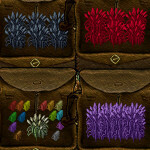 This unique, dedicated plant vendor location boasts every breed of plant available, in all normal colours, and occasionally rares and mutants, too. Vendors are named by the type of plant they sell (eg: Ponytail Palm vendor), so it is very easy to find what you are after. Stock levels are also maintained with dedication, so you rarely find them out of stock. In addition to the normal plant vendors, there are a few others: a Seed and Bonsai vendor, a BOD/Talisman vendor, and a Misc vendor which stocks repair deeds, engraving kits, bone machetes, and a few other things. 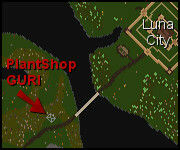 The quickest way to PlantShop GURI is to exit Luna City via the South Gate, head straight down the path and across the bridge. From here, a short walk down the path will bring PlantShop GURI into easy view (it’s right on the path).